Refrigerator design is more important than you think. Today, we’re giving refrigerators much-deserved thought (and offering a peek inside some of our staff’s fridges). 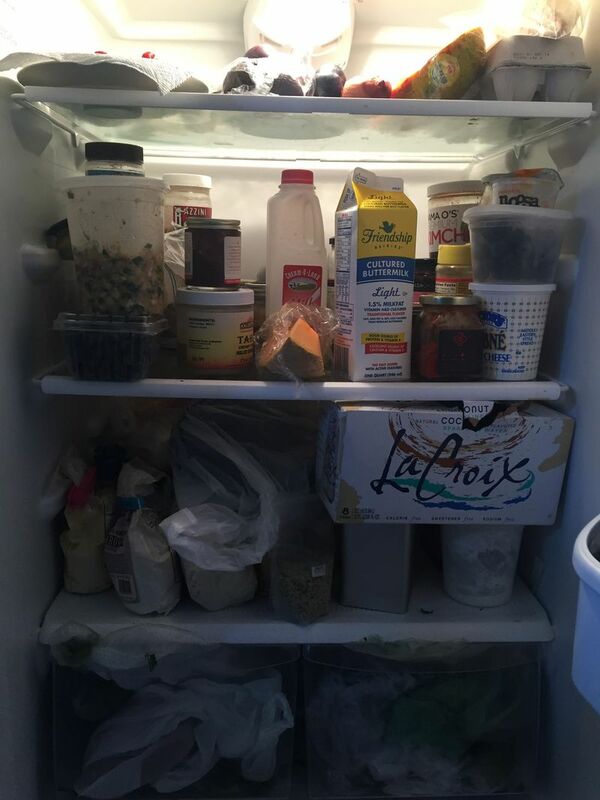 Lauren Locke‘s fridge, with French doors (and Lillet!). It turns out that how you eat isn’t just about what food you buy, where you buy it, or what you make with it—it’s also about where you’re putting it. Your refrigerator is a mirror onto your eating and cooking habits. But how much thought have you put into it lately? Not its dirty shelves nor why on earth there’s cereal in there (yes, our head of customer experience Lauren Kelley keeps cereal in the refrigerator—see below for proof)—but rather its layout. Professor of history Jonathan Rees wrote not one but two books on the subject. His most recent, Refrigerator (part of a collection called Object Lessons), came out just last Thursday. Lauren Kelley keeps Cheerios in the refrigerator. Rees’ theory is that refrigerator design is a reflection of food culture—to study how it has evolved over time and how it differs between various world regions is to analyze how people shop for and cook food in that time and place. The design of refrigerators—the shape, the color, the shelf arrangement, the fancy features (like a vegetable crisper or a “Cool Zone” or an ice maker)—reflects and affects the way we shop and eat. First and foremost, there’s the size. For those who have traveled between the U.S. and Europe, the most striking difference is that refrigerators here are mammoth in comparison. Fifteen or twenty years ago, a very large fridge might have meant 22 cubic feet, but now, Amazon has a whole category of refrigerators larger than 30. A big fridge means you don’t have to shop as much: You might drive to Walmart or Costco every Sunday, pack your car full of groceries, and stock up for the next couple of weeks. And for those who live far from the grocery store, that’s the most convenient option. Gabi‘s tall and narrow steel fridge vs. Leslie‘s shorter, wider, plastic-coated one. In European cities, where markets are aplenty and space is limited, there’s no great big reason to have a great big fridge. The refrigerators in Paris are rail-thin compared to those in Houston; they’re not a little smaller—they’re half the width, and it’s a sign both of the frequency with which people shop (shopping more often means storing less) and of the value of floor space. In European cities in particular, where square footage is such a high-priced commodity, the goal is to take up as little room as possible. 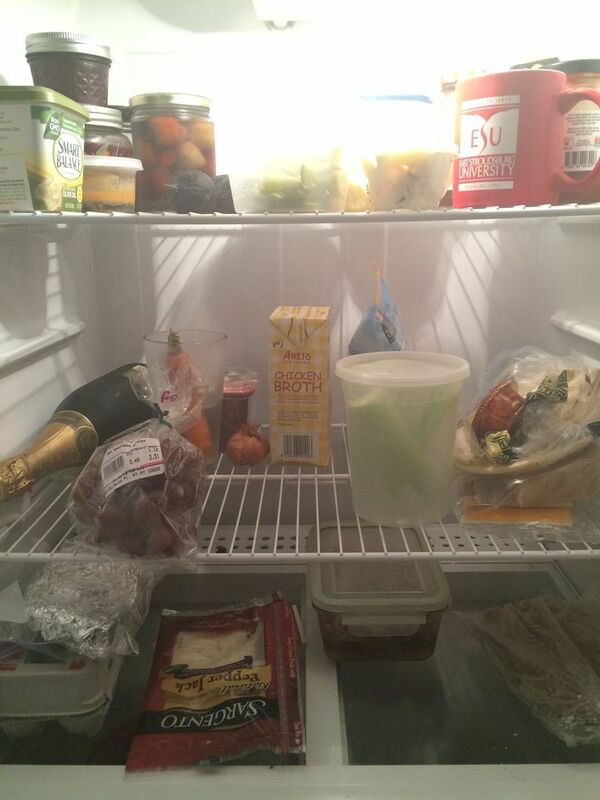 Hillary‘s very full fridge vs. Amanda‘s very empty one (she admits to eating dumplings on most nights). Beyond the size of the refrigerator, there’s also the color. 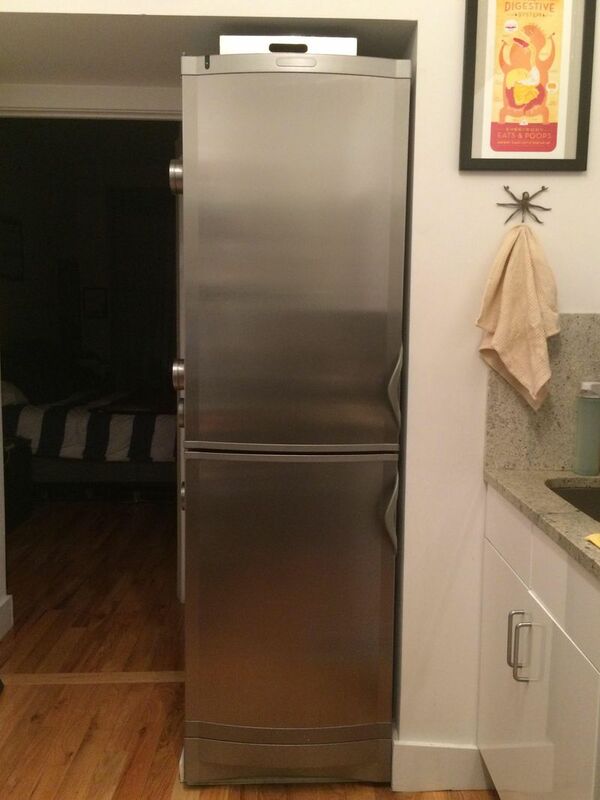 Steel is the fridge color in the U.S. According to Rees, this is a recent preference intended to make refrigerators more inviting to men. In a space that has been almost exclusively a woman’s domain, the steel connotes industry and makes men feel, at least subconsciously, more comfortable. Then, there are the accessories—the accoutrements and ritzy features that, Rees says, will tell you something about how important the refrigerator is to the owner but which aren’t crucial to the refrigeration technology. The real improvements in refrigerator energy efficiency happened in the 1970s, explains Rees—basic refrigerator function and design hasn’t really changed in over 50 years. Lindsay-Jean‘s fridge (she keeps flour in the freezer) vs. Karl‘s (he keeps Campari on the door). When you’re upgrading your fridge or buying a new model, what you’re paying for is additional square footage and/or assorted features (some refrigerators counterintuitively even spout hot water! )—not innovative technology. Our test kitchen fridge (note the vast quantities of grapes and the parchment rolls of cookie dough). Even Erin’s Smeg came with “standard with a variety of compartments that [she] didn’t really need. Large metal bottle holders (it would make a great beverage fridge in a home), built in egg holders, lots of mini dividers, etc.” Erin removed most of these pieces and readjusted the shelves to suit her particular needs. Ali’s Italian refrigerator, on the other hand, consisted of only shelves (and not plastic shelves—rubber-coated metal shelves): It has no drawers, no vegetable crisper, no cheese drawer, and no freezer compartment). The test kitchen butter abundance (left) and our team kitchen fridge, starring prosciutto (right). So the next time you’re attracted to the refrigerator with four doors and three evaporators and a platinum cooling system, consider just reorganizing your current model instead. What type of fridge do you have (and how did you select it)? Tell us in the comments!